Markets pushed higher on Friday, after some hesitation earlier in the week. With the lunar green period continuing this week we can start looking how high it may go. Our line in the sand at 3300 was touched and then the market turned up strongly. 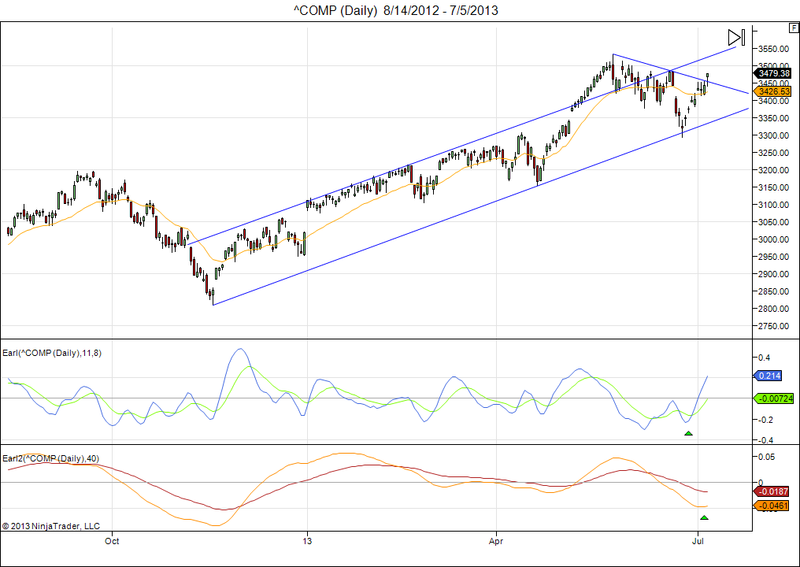 The technical setup looks good going forward, and the next step should be to test the 3550 overhead resistance level. That could happen this week already. Notice how my slower Earl2 indicator (orange line) is turning up from a bottom, which suggests that the rally can now continue well into August. A failure to do so would probably paint a bearish divergence in the Earl2, which would be a bad omen going into autumn. But we will consider that case when we actually see such a divergence. For now it is better to go with the flow, which is still up. This entry was posted on July 8, 2013 at 9:06 am	and is filed under Financial Astrology, Market Commentary. Tagged: Nasdaq. You can follow any responses to this entry through the RSS 2.0 feed. You can leave a response, or trackback from your own site. Our next lunar red period will start on Friday indeed. But given the current strong upward momentum, and no sign of a top in my indicators yet, we may see the current market rally continue into the yellow period, which means until the end of next week. That is quite common near the end of multi-month bull runs. So, we need to watch carefully. I think quite a few investors took on short positions in June, thinking that it was the start of a serious correction. Some of them will be forced to cover their shorts if the market pushes to new highs (the Russell 2000 already did so yesterday), and that would add more fuel to the fire. This is how important tops are often created. I think the summer months will not be easy to navigate this year. None of the systems or indicators we consider are 100% accurate, far from it. So, it’s always important to remember that some cycles will get pushed forwards or backwards from time to time. It cannot be otherwise. Sometimes all considered cycles and indicators point in the same direction, and then we have a high probability setup. But far more often we have a situation where one of the cycles or indicators disagrees with the other ones, and then it is not so easy to estimate what will prevail. As you point out, the Four Pillars Finance cycles will be down for August and September. Then how can the rally continue into August? 2) The decline (if we get one) does not necessarily start on the very first day of the given month. E.g. it can easily start a few weeks late and still be “correct” on the monthly scale considered in FPF. 3) The lunar cycles tend to come into play as well. August will have a lunar red period in the middle, with green period in the first and last weeks. This favors the case for some top to be made in the first week, then weakness in the middle of the month, and pending on how we get through that red period, the market may challenge for new highs again in the last week of August, possibly setting up a double top. If that happens then the Earl2 is likely to have moved in the position where it tops out and turns down. That’s when all the “domino stones” would be lined up to produce a significant move. Basically, my systems indicate fairly clear sailing until August 7th, and after that it gets tricky. Whatever happens, I would be very cautious throughout August and September. I will cover that on the blog as we get to that point. Some people say it is important to keep faith in your system. But I disagree on that. I think it is more important to keep doubting your system, even if it has been working very well recently, and I would even say: especially if it has been working very well recently. By keeping a healthy doubt one is more able to see when the system is failing and thus adjust or step aside when needed. The person with too strong faith in his approach goes on fighting the market to prove himself and his system right. That can become very costly. So, a subtle balance needs to be found. One needs sufficient faith in a system to be able to act on it when the time is right, but at the same time one needs enough healthy skepticism and doubt in the system to be able to get out whenever the market is proving it wrong. That’s why I do not automatically assume that August and September HAVE to be down months no matter what. The FPF cycle may fail and other forces may prevail. We have to be ready for that possibility as well. If you download the program you will see the yellow (and the black) periods, and there is brief explanation in the help files. I do not mention everything on the blog, because 1- for newcomers it is complicated enough already, and 2- some details are reserved for the people who bought the software and the ebook.